Have you been searching for an arugula salad recipe with fruit? Then you might want to make this easy arugula salad recipe! It is a simple and quick salad recipe that only requires only a few ingredients. This salad is delicious for all seasons and absolutely refreshing! It is perfect for lunch, a work potlcuk or as a main meal for dinner. Because this is a arugula salad recipe with fruit it has both sweet and savory notes that make it highly versatile for a variety of occasions. This salad works well with brunch, is perfect for a work potluck, or a main dinner salad and pairs well with red wine! 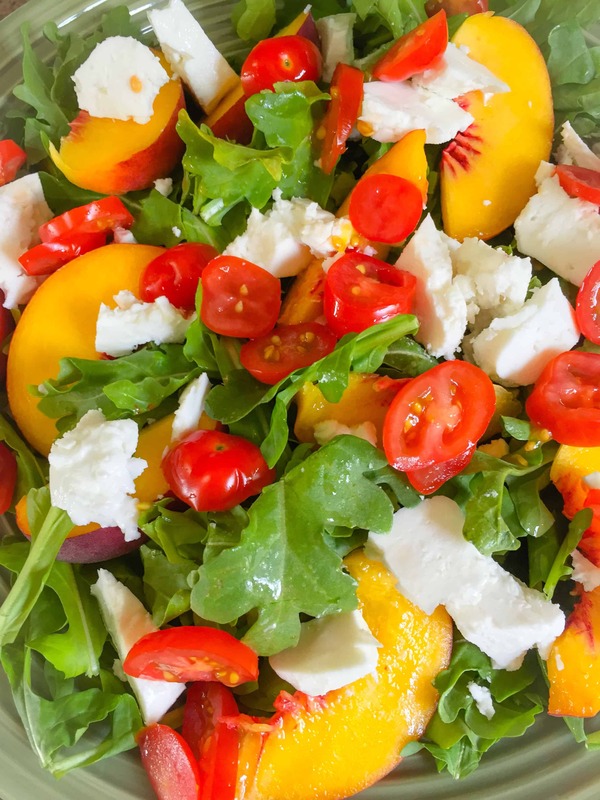 Who doesn’t love the juicy sweetness of peaches cut with the salt of feta cheese and tossed with the peppery notes of arugula? Can you say “YUM!” (That was great!). Peaches, cherry tomatoes, feta, arugula… what’s not to like?!?! Salads with fruit can achieve a lot of flavor goals and this easy recipe knocks it out of the park! Wash and dry arugula in a salad spinner and place in a small bowl. Pour lemon juice and olive oil on top of the arugula and toss with your hands. Combine remaining ingredients and gently toss with your hands. Plate and enjoy! This recipe can be modified to suit your taste buds, off course! Feel free to add a protein of your choice. The flavors mesh oh so well with salmon and grilled chicken --- the perfect solution for tuning this salad in the a heavier meal! Tried this recipe and it’s was delightful everything was perfect. This salad is a great taste of a spring to autumn transition. Hurray! I’m so glad you enjoyed it!